EMPIRE ROOFTOP LOUNGE HALLOWEEN PARTY – MIDTOWN ROOFTOP NYC - HOTTEST HALLOWEEN ROOFTOP MIDTOWN PARTY NYC WITH THE HOTTEST COSTUMES! HALLOWEEN NIGHT ORANGE IS THE NEW BLACK! 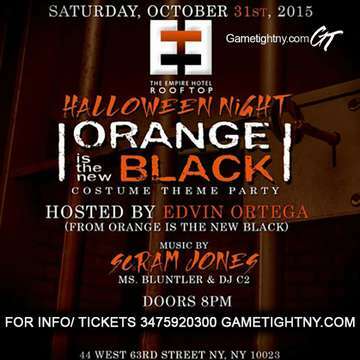 HOSTED BY EDVIN ORTEGA FROM "ORANGE IS THE NEW BLACK" WITH MUSIC BY NYC HOTTEST DJS SCRAM JONES & MORE AT EMPIRE HOTEL HALLOWEEN NYC IN MIDTOWN! HALLOWEEN IN ROOFTOP MIDTOWN NYC PARTY! TICKET EVENT 21 & OVER! HALLOWEEN ROOFTOP PARTY @EMPIRE HOTEL ROOFTOP IN MIDTOWN NEW YORK CITY, NY! CAPACITY EXPECTED! BUY YOUR TICKETS NOW FOR JUST 20$! EARLY BIRD SPECIAL! HALLOWEEN NIGHT ORANGE IS THE NEW BLACK HALLOWEEN DECORATIVE EVENT! Empire Hotel Rooftop NYC Halloween Dress Code: Its Halloween – be creative! Empire Rooftop NYC Halloween Music Type: Best of Hip-Hop, Reggae, EDM, Latin, House, Dance, Top 40 & more! Empire Hotel Rooftop Lounge NYC Halloween Bottle Packages: Bottle Prices available by request. RECAP OF LAST YEAR AT EMPIRE HOTEL ROOFTOP LOUNGE HALLOWEEN NYC!